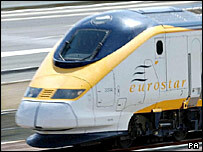 Eurostar has set itself the target of cutting CO2 emissions per passenger by 25% by 2012. The Channel Tunnel passenger train operator also says that its journeys will be carbon neutral from 14 November when it services from St Pancras begin. Its measures to cut emissions include putting meters in trains to encourage efficient driving. Emissions that cannot be eliminated will be offset. Eurostar says that it emits about 50,000 tonnes of CO2 a year. Eurostar says driving a train more efficiently is similar to driving a car more efficiently, involving accelerating and braking less sharply. "The German train network installed meters in a lot of its trains several years ago. We've been talking to them, and they believe they've achieved some very significant savings from doing this," said Eurostar chief executive Richard Brown. Eurostar will also try to buy electricity from greener sources, although it will have to do that through track operators such as Network Rail and Eurotunnel, because it does not buy much of its own electricity. Certified Emission Reductions, which are a form of offsetting, trade for about 15 euros ($20; £10) a tonne, which would mean that Eurostar's current 50,000 CO2 tonnes a year would cost about 750,000 euros to offset. Richard Brown said the firm's plans were similar to airlines offering to arrange offsetting, except that with Eurostar the passenger will not have to pay. "What we're saying is we're going to offset our whole activity and we're not going to expect you to pay for it," he said. "We think it's the company's responsibility to do this - not passing the responsibility onto passengers."